Each year, 100 s of post-impact assessment (PIA) studies are conducted to assess the impact of the hazards generated by the oil industry on the physical and social environment and on human health. But, most of these studies are conducted without any significant contributions from health professionals and are reported without highlighting the immediate and long-term implications of the identified hazards on the health of members of the impacted communities. This was sadly commented upon in the United Nations Environment Programme (UNEP) Ogoni environmental assessment report;  and is likely to continue because even the technical review of the impact assessment reports, carried out by the Federal Ministry of Environment, often do not include a health professional. This study is an interpretation of the human health implications of the data reported in several published studies on the impact of oil spills in the oil-bearing communities of the Niger delta region, Nigeria. It was designed to highlight the human health implications of the oil spills in the face of a total lack of such information in the official PIA reports. Oil spill is a common fallout of oil exploitation and exploitation in the Niger delta region, with an estimated total of over 7000 oil spill incidents reported over a 50-year period. This study used the quantitative data contained in published, peer-reviewed studies, carried out on some of these crude oil spills, following the futile attempts to gain access to the official PIA studies of the oil spills. An Internet search was conducted on 17 August 2012 to extract quantitative data on the quantity of crude oil spilled into the Niger delta environment; the concentrations of the pollutants in surface water, ground water, ambient air, and the tissues of plants and fish in the polluted environment; the impact of the oil spill on household food security; and the direct impact of the oil spill on human health. The Internet search was complemented by manual search in the library of the University of Port Harcourt and by contacting researchers known to be active in the field. The oil spills often resulted in contamination of surface water with hydrocarbons and trace metals, as measured using atomic spectrometry. A study carried out in the mangrove wetland of the region recorded a mean Total Hydrocarbon THC concentration of 23.6 + 4.3 mg/l in the water, a mean concentration of 449.30 ± 55.42 μg/g in Tympanotonus fuscatus (Periwinkle) and 278.57 ± 34.57 μg/g in Periophthalmus papillio (Mudskipper). Another study recorded concentrations of benxo (a) pyrene that ranged from 0 to 2.32 ug/l. 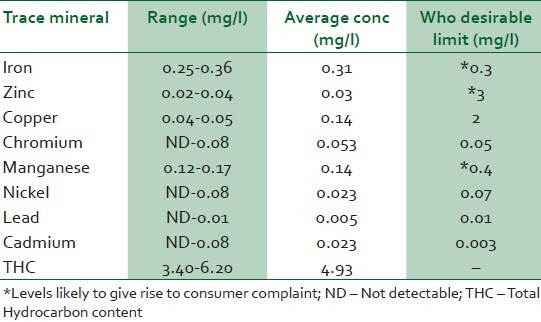 The trace metal contamination as recorded in a study carried out in the Ughoton stream, in Edo State,  is shown in [Table 2]. The crude oil spills reduced soil fertility. They also smothered economic trees and food crops, outrightly killing them or reducing their yield,  causing a 60% reduction in household food security  as assessed using the Cornell-Radimer scale and shown in [Table 4]. 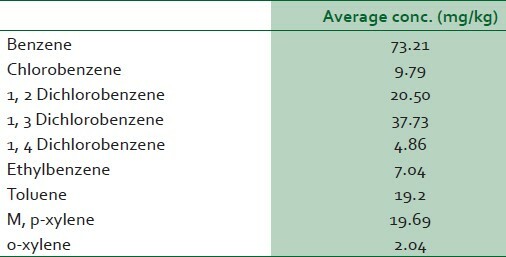 The oil spills also reduced the quality of food crops; the ascorbic acid content of waterleaf was reduced by 36% [Table 5]  while the crude protein content of cassava was reduced by 40% [Table 6]. The food insecurity and deterioration of the quality of the staple food led to a 24% increase in the prevalence of childhood malnutrition in the affected communities [Table 7]. The crude oil spills also resulted in the bio-accumulation of heavy metals in the surviving food crops like cassava and pumpkin [Table 8]. The concentration of lead and cadmium increased in the leaves of pumpkin by 90% and 94.29%, respectively. The review also showed that crude oil spill could cause a 45% increase in the normal background radiation level. This is another carcinogenic danger that could manifest as increased prevalence of certain cancers years after the oil spill. The radiation contamination caused by crude oil spill in the Niger delta region is often so widespread that the surface water  and crops grown in the impacted environment  are also contaminated beyond the maximum permissible limit. The ingestion, dermal contact, and inhalation of the other constituents of spilled crude oil also have some acute and long-term health implications. 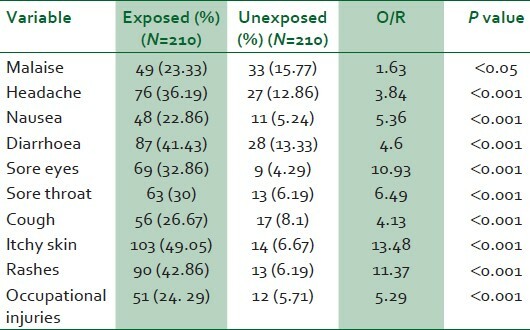 Although the acute manifestations of the exposures were often mild and transient, as shown in [Table 9], severe exposures as reported in the 2-year-old child could result in acute renal failure,  or even hepatoxicity  and hemotoxicity,  as reported in the animal studies. The period prevalence of the symptoms reported in the Niger delta region were noted to be higher than the prevalence reported in the grounded oil tankers, , indicating greater levels of exposure in the Niger delta region. For instance, the period prevalence of sore eyes in the Niger delta study was 32.86% compared with 28% recorded during the grounding of the tanker braer in Shetland, Scotland  and 19.7% recorded during the Sea Empress oil spill in south west Wales. This difference was attributed to the fact that members of the impacted communities in the Niger delta region, being sustenance farmers and fisher-folks, continued to ply their trade in the polluted environment, without any protective gadgets. The prevalence of diarrhoea was also noted to be significantly higher in the Niger delta study because the fish and animals killed by the spill were eaten. About one-fifth of the oil spills were attributed to third party activity and therefore, did not attract any form of compensation to the impacted communities according to a clause in the Nigeria's Oil Pipeline Act that was designed to discourage sabotage. It is surprising that material relief and medical care were seen as "compensation" and therefore denied to members of the impacted communities. Desperate members of the communities were often forced to eat the fish killed by the spill and made to bear the full cost of any resultant health problem. Considering the possible acute and long-term effects of exposure to the oil spill, it is not fair to allow innocent members of the communities to face the situation alone; the least they should get are material relief and immediate and long-term medical treatment, the world standard for persons exposed to potentially carcinogenic environmental hazards. This formed the basis of the public health recommendations in the Ogoni UNEP report,  and should be the standard practice throughout Nigeria. The review of these studies shows that oil spills in the Niger delta have acute and long-term effects on human health. Material relief and immediate and long-term medical care are recommended, irrespective of the cause of the spill, to ensure that the potential health effects of the exposures to the spills are properly addressed. 1. World Health Organization. The World Health Report: 2002: Reducing risks, promoting healthy life. Geneva: World Health Organization; 2003. p. 1 -71. 2. WHO. Facing the facts: The impact of chronic disease in Nigeria. Geneva: WHO; 2005. Available from: http://www.who.int/chp/chronic_disease_report/en/. [Last assessed on 2011 Mar 12]. 3. United Nations Environment Programme. Environmental Assessment of Ogoniland. Nairobi, Kenya: UNEP; 2011. p. 8-17. 4. Environmental Resources Managers Ltd. Niger Delta Environmental Survey Final Report Phase I; Volume I: Environmental and Socio-Economic Characteristics. Lagos: Niger Delta Environmental Survey; September 1997. 5. U.S. Energy Information Administration. Nigeria: Country Analysis Brief; 2005. 6. United Nations Development Programme. Niger Delta Human Development Report. Abuja, Nigeria: UNDP; 2006. 7. Donohue JM, Abernathy CO, Lassovszky P, Hallberg GL. The contributions of drinking water to total daily dietary intakes of selected trace mineral nutrients in United States. In: World Health Organization. Nutrients in Drinking Water. Geneva: WHO; 2005. p. 75-91. 8. Steiner R. Double standard: Shell practices in Nigeria compared with International standards to prevent and control pipeline oil spills and the deepwater horizon oil spill. Amsterdam, The Netherlands: Milieudefensie; 2010. p. 11-5. 9. Achebe CH, Nneke UC, Anisiji OE. Analysis of oil pipeline failures in the oil and gas industries in the Niger delta area of Nigeria. Proceedings of The International Multi Conference of Engineers and Computer Scientists 2012. p. 1274-9. 10. Clinton HI, Ujagwung GU, Horsfall M. Evaluation of total hydrocarbon levels in some aquatic media in an oil polluted mangrove wetland in the Niger delta. Appl Ecol Environ Res 2009;7:111-20. 11. Anyakora C, Ogbeche A, Coker A, Ukpo G, Ogah C. A screen for benxo (a) pyrene, a carcinogen, un the water samples from the Niger delta, using GcM. Nig Qt J Hosp Med 2004;14:288-93. 12. Uzoekwe SA, Achudume AC. Pollution status and effect of crude oil spillage in Ughoton stream ecosystem in Niger Delta. J Ecol Nat Environ 2011;3:469-73. 13. Etu-Efeotor JO, Akpokodje EG. Aquifer systems of the Niger Delta. J Mining Geol 1990;26:279-85. 14. Ogbuagu DH, Njoku JD, Uzoije AP, Nwachukwu JI, Ebe TE. Correlates in groundwater quality parameters and textural classes of soils in a peri-industrial district of the Nigerian delta region. J Environ Earth Sci 2012;2:40-51. 15. Amangabara GT, Njoku JD. Assessing groundwater vulnerability to the activities of artisanal refining in Bolo and environs, Ogu/Bolo Local Government Area of Rivers State; Nigeria. British J Environ Clim Chang 2012;2:28-36. 16. Osuji LC, Achugasim O. Trace Metals and Volatile Aromatic Hydrocarbon Content of Ukpeliede-I Oil Spillage Site, Niger Delta, Nigeria. J Appl Sci Environ Manage 2010;14:17-20. 17. Ajayi TR, Torto N, Tchokossa P, Akinlua A. Natural radioactivity and trace metals in crude oils: Implication for health. Environ Geochem Health 2009;31:61-9. 18. Agbalagba OE, Meindinyo RK. Radiological impact of oil spilled environment: A case study of the Eriemu well 13 and 19 oil spillage in Ughelli region of delta state, Nigeria. Indian J Sci Technol 2010;3:1001-5. 19. Meindinyo RK, Agbalagba EO. Radioactivity concentration and heavy metal assessment of soil and water, in and around Imirigin oil field, Bayelsa state, Nigeria. J Environ Chem Ecotoxicol 2012;4:29-34. 20. Osuji LC, Nwoye I. An appraisal of the impact of petroleum hydrocarbons on soil fertility: The Owaza experience. Afr J Agric Res 2007;2:318-24. 21. Edema NE, Obadoni BO, Erheni H, Osakwuni UE. Eco-phytochemical studies of plants in a crude oil polluted terrestrial habitat located at Iwhrekan, Ughelli north local Government area of delta state. Nat Sci 2009;7:49-52. 22. Ordinioha B, Sawyer W. Food insecurity, malnutrition and crude oil spillage in a rural community in Bayelsa State, south-south Nigeria. Niger J Med 2008;17:304-9. 23. Nwaoguikpe RN. The effect of crude oil spill on the ascorbic acid content of some selected vegetable species: Spinach oleraceae, Solanum melongena and Talinum triangulare in an oil polluted soil. Pakistan J Nutr 2011;10:274-81. 24. Osam MU, Wegwu MO, Uwakwe AA. The Omoku old pipeline oil spill: Total hydrocarbon content of affected soils and the impact on the nutritive value of food crops. Arch Appl Sci Res 2011;3:514-21. 25. Nkwoocha EE, Duru PO. Micro-analytic study on the effect of oil pollution on local plant species and food crops. Adv Biores 2010;1:189-98. 26. Ordinioha B, Sawyer W. Acute health effects of a crude oil spill in a rural community in Bayelsa State, Nigeria. Niger J Med 2010;19:140-4. 28. J Forensic Med Toxicol 2005;6. Available from: http://www.anilaggrawal.com/ij/vol_006_no_002/papers/paper004.html. [Last accessed 2012 Sep 19]. 29. Adesanya OA, Shittu LA, Omonigbehin EA, Tayo AO. Spermatotoxic impact of bonny light crude oil (BLCO) ingestion on adult male Swiss albino mice. Int J Phy Sci 2009;4:349-53. 30. Eyong EU, Umoh IB, Ebong PE, Eteng MU, Antai AB, Akpa AO. Haematoxic effects following ingestion of Nigerian crude oil and crude oil polluted shellfish by rats. Niger J Physiol Sci 2004;19:1-6. 31. Sunmonu TO, Oloyede OB. Biochemical assessment of the effects of crude oil contaminated catfish (Clarias gariepinus) on the hepatocytes and performance of rat. African J Biochem Res 2007;1:83-9. 32. Oruambo IF, Peter-Omoghia CA. Alterations in chromatin DNA and protein absorbance ratio in the liver of albino rats (Rattus norvegicus) treated with bonny light crude oil. J Appl Biosci 2012;54:3911-5. 34. Ana GR, Sridhar MK, Asuzu MC. Environmental risk factors and hospital-based cancers in two Nigerian cities. J Public Health Epidemiol 2010;2:216-23. 35. Avwiri GO, Osaralube GO, Alao AA. Assessment of norm-containing food crops/stuffs in OML 58 and OML 61 within the Niger delta region of Nigeria. Indian J Innovations Dev 2012;1:18-25. 36. Campbell D, Cox D, Crum J, Foster K, Brewster D. Initial effects of the grounding of the tanker Braer on health in Shetland. BMJ 1993;307:1251-5. 37. Lyons RA, Temple JM, Evans D, Fone DL, Palmer SR. Acute health effects of the Sea Empress oil spill. J Epidemiol Community Health 1999;53:306-10. 38. Suarez B, Lope V, Perez-Gomez B. Acute health problems among subjects involved in the cleanup operation following the Prestige oil spill in Asturias and Cantabria (Spain). Environ Res 2005;99:413-24. 39. WHO/FAO/IAEA. Trace elements in human nutrition and health. Geneva: World Health Organization; 1996. 40. WHO. Guideline for drinking water quality. 4 th ed. Geneva: World Health Organization. 2011. 41. Amadi PA, Ofoegbu CO, Morrison T. Hydrological assessment of groundwater quality in parts of the Niger delta, Nigeria. Environ Geology Water Sci 1989;14:195-202. 42. Bhutta ZA, Black RE, Brown KH, Gardner JM, Gore S, Hidayat A et al. Prevention of diarrhoea and pneumonia by zinc supplementation in children of developing countries: Pooled analysis of randomized controlled trials. Zinc investigators′ collaborative group. J Paediatrics 1999;135:689-97. 43. Olivares M, Uauy R. Essential nutrients in drinking water. In: World Health Organization. Nutrients in Drinking Water. Geneva: WHO; 2005. p. 41-60. 44. Ziegler EE, Edwards BB, Jensen RL, Mahaffey KR, Fomon SJ. Absorption and retention of lead by infants. Pediatr res 1978;12:29-34. 45. Jeremiah ZA, Konate BB. Anaemia, iron deficiency anaemia among blood donors in Port Harcourt, Nigeria. Blood Transfus 2010;8:113-7. 46. Mahaffey KR. Nutritional factors in lead poisoning. Nutr Rev 1981;39:353.WHO. Evaluation of certain food additives and contaminants. Seventy-third report of the Joint FAO/WHO Expert Committee on Food Additives. Geneva: World Health Organization; 2011. 47. Nogawa K, Kobayashi E, Okubo Y. Environmental cadmium exposure, adverse effects and preventive measures in Japan. Biometals 2004;17:581-7. 48. Rice AL, Sacco L, Hyder A, Black RE. Malnutrition as an underlying cause of childhood deaths associated with infectious diseases in developing countries. Bull World Health Organ 2000;78:1207-21. 49. Nwauche CA, Akani CI. An assessment of high risk sexual behaviour and HIV transmission among migrant oil workers in the Niger Delta area of Nigeria. Niger J Clin Pract 2006;9:48-51. 50. Anochie IC, Ikpeme EE. Prevalence of sexual activity and outcome among female secondary school students in Port Harcourt, Nigeria. Afr J Reprod Health 2001;5:63-7. 51. Federal Ministry of Health (Nigeria). 2003 National HIV/AIDS and Reproductive Health Survey. Nigeria: Federal Ministry of Health Abuja; 2004. 52. Federal Ministry of Health (Nigeria). 2010 HIV Sero-Prevalence Sentinel Survey. Nigeria: Federal Ministry of Health Abuja; 2010. Musa, A., Yusuf, Y., McArdle, L., Banjoko, G.